Published by Cyril Huze December 13th, 2016	in Chassis, Customs, Editorial and Electrical. 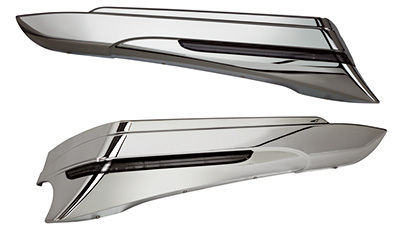 LED Panels for ‘06-up Street Glide® and ‘10-up Road Glide® help you customize the rear end of your Street Glide® or Road Glide®. These LED panels combine style and function, blending in seamlessly to match the existing lines of the back of your tourer. Running lights, high intensity brake lights, and ultra-bright plasma amber turn signals dramatically increase visibility for safety. Easy to install with simple plug-and-play connections. No drilling, splicing or special tools required. Lenses are easily removed for paint. Available in chrome and gloss black for ’06-’09 FLHX and ’10-up FLHX, FLTRX. Retail price is $329.95-$369.95. Saddlebag Extensions for ’97-’13 FLHT/U, ’97-’13 FLTR/U, ’06-’13 FLHX and ’10-’13 FLTRX. 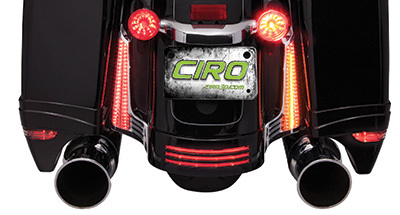 They will help increase visibility from the rear and sides with built-in LED run, turn and brake lights. Under bags are radiused for less worry about leaning too far into corners as you would with most extended bags. These saddlebag extensions are an easy plug-and-play installation with only a few bolts needed. Available in The light housing is easily removed before paint. Retail price is $329.95-$359.95. At Ciro 3D. $369.00 for two small LED panels? I realize things are not as cheap as they use to be but give us a break! It probably cost $5.99 for these panels to be manufactured in China! Yay! Just what we need, more circus lights made in China! I wasn’t gonna say anything, but……….